I "met" Nelson Mandela in an unlikely way...and it changed my life forever! At the time, I was struggling with the pressure to keep others in my life okay. I felt like I needed to shrink back from what God was doing in and through my life so as to not cause them problems or so they didn’t think I was showing off. This was at a time when our son was a student at University of Dayton. Jeremy was being inducted into an honor society, and there was, of course, a ceremony with speeches etc. I was happy to be there but somewhat dreading having to sit through long speeches. Wow! Was I surprised! God in His grace used the short, but pointed, speech of the college chaplain to speak to my heart. I don’t remember what he said, but I do remember two quotes he used which changed my life that very day. One of those quotes was that of Nelson Mandela. And that is when I met Mandela. And I've loved him and his legacy ever since. Here is what I heard that day. May the Lord use it to set you free also, my friend. Our deepest fear is not that we are inadequate.Our deepest fear is that we are powerful beyond measure.It is our light, not our darkness, that most frightens us.We ask ourselves, who am I to be brilliant, gorgeous, talented and fabulous?Actually, who are you not to be?You are a child of God.Your playing small doesn’t serve the world.There’s nothing enlightened about shrinkingso that other people won’t feel insecure around you.We were born to make manifest the glory of God that is within us…And as we let our own light shine,we give other people permission to do the same.As we are liberated from our own fear,our presence automatically liberates others. 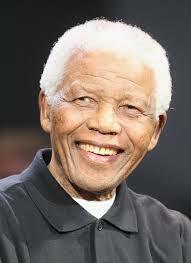 Rest in peace with your Lord, dear brother Mandela!